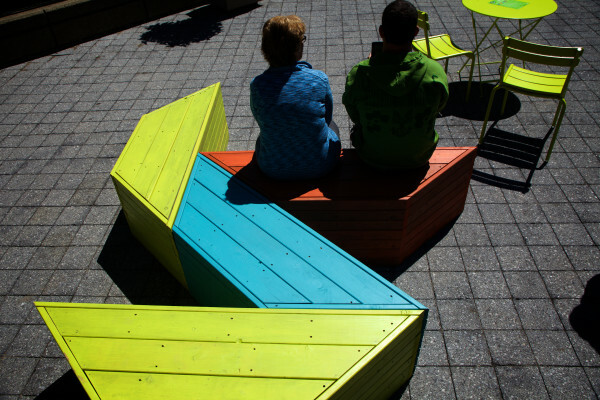 A man and a woman sit on colorful benches in Congress Square Park in Portland on Wednesday as Friends of Congress Square Park celebrated the implementation of a $100,000 grant from Southwest Airlines. 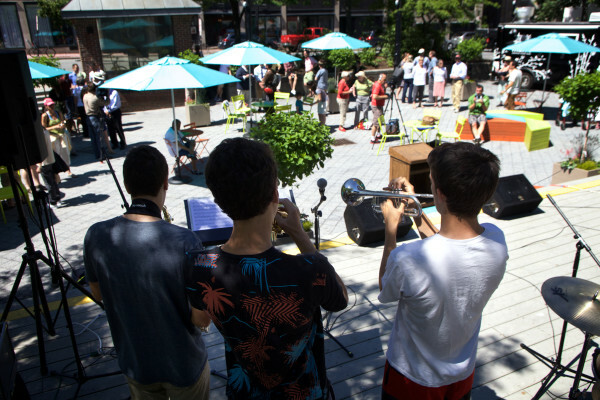 The horn section of the Polaroid Garden band play in Congress Square Park in Portland on Wednesday as Friends of Congress Square Park celebrated the implementation of a $100,000 grant from Southwest Airlines. 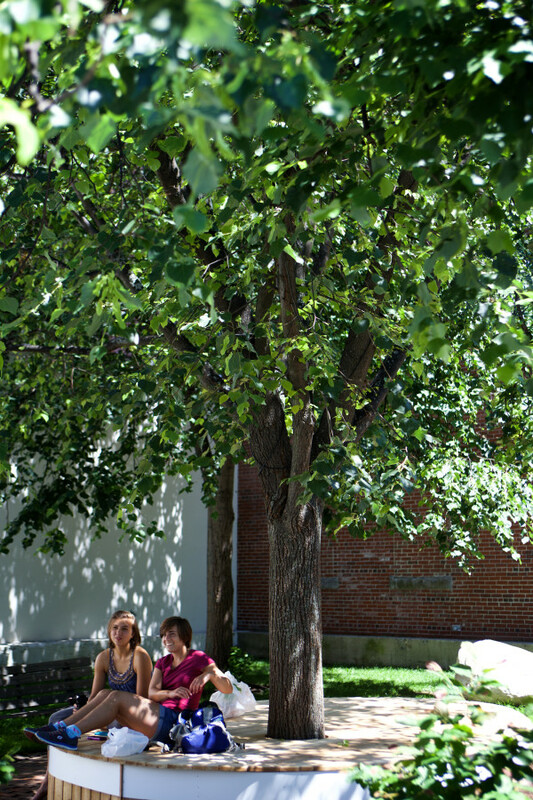 Sophia Rosenfeld (left) and Caroline Bruno enjoy the shade in Congress Square Park in Portland on Wednesday as Friends of Congress Square Park celebrated the implementation of a $100,000 grant from Southwest Airlines. 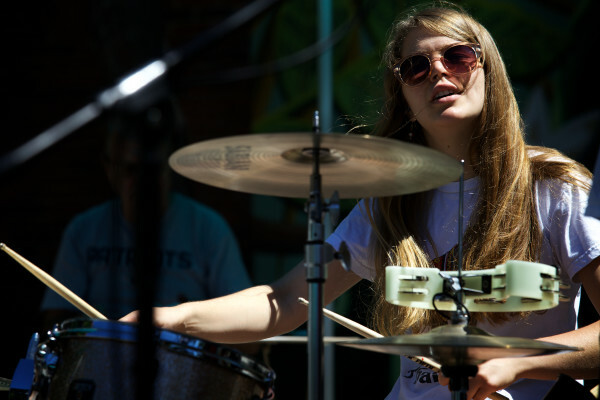 Drummer Joanna Quinn plays with the Polaroid Garden band in Congress Square Park in Portland on Wednesday as Friends of Congress Square Park celebrated the implementation of a $100,000 grant from Southwest Airlines. 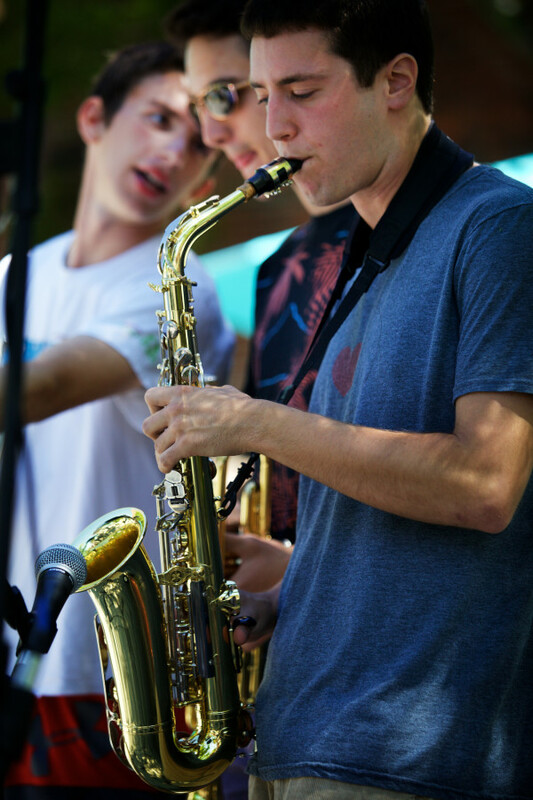 Kevin Merrow plays saxophone with the Polaroid Garden band in Congress Square Park in Portland on Wednesday as Friends of Congress Square Park celebrated the implementation of a $100,000 grant from Southwest Airlines. Portland Mayor Michael Brennan speaks in Congress Square Park on Wednesday as Friends of Congress Square Park celebrated the implementation of a $100,000 grant from Southwest Airlines. 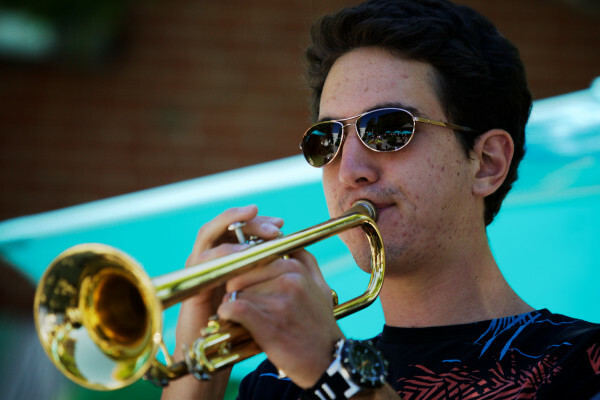 Trumpeter Sam Woodward plays in Congress Square Park in Portland on Wednesday as Friends of Congress Square Park celebrated the implementation of a $100,000 grant from Southwest Airlines. PORTLAND, Maine — Organizers who took to the polling booth to block the private sale of a downtown park about one year ago on Wednesday celebrated a $100,000 grant to support programming and improvements in the square. Congress Square Park, near the center of the most densely populated square mile in the state, became a focal point for discussion about city planning and the maintenance of Portland’s public spaces and parks. Frank Turek, the founding president of the group, said the $100,000 grant from the “Heart of the Community” program funded by Southwest Airlines and supported by the Project for Public Spaces would have been hard to imagine a year ago. After the city agreed to sell the park to the adjoining hotel developer, the group organized and won a referendum to block the sale and kept the square busy during the summer months with public World Cup soccer viewings, dance parties, free wireless Internet and a food truck. 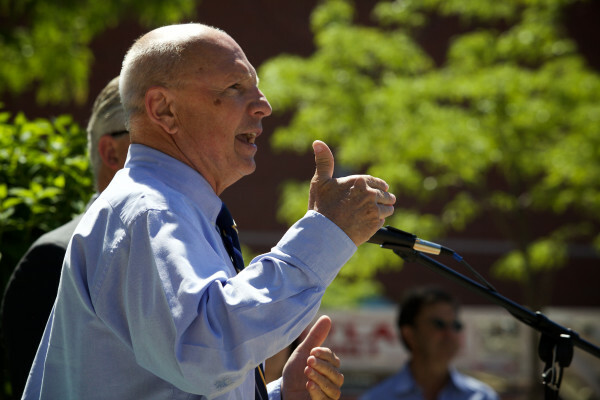 Herb Adams, a founding member of the Friends of Congress Square Park, a historian and former state representative, said Wednesday he thinks that fight will be remembered alongside the battle over a waterfront zoning ordinance in the late 1980s. Adams said he thinks the fight over the park will have a lasting impact on planning discussions amid economic pressures, despite the Congress Square fight dealing narrowly with the sale and use of public parks. “I think as we emerge from a recession — a long recession — and development money flows back into the city, these new processes will enable caring citizens who have a lot to say about the future of their living space [to have influence] rather than just have the process driven by money and profit,” Adams said. Brennan said the redevelopment of the park stands to “revitalize” the downtown and demonstrated the benefit of public-private partnerships, saying the city alone could not have done the work to improve the park and schedule events. The Friends of Congress Square Park now operates as a nonprofit to manage amenities such as free WiFi, park benches and other installations. Jamie Parker, a member of the city’s Parks Commission, said he attributes the redevelopment of the park in part to the city’s decision to sell most of the 14,000-square-foot plot. “Almost losing something is a way to appreciate it anew,” Parker said. The nonprofit organization that now manages the park has a slate of events planned throughout the summer, ranging from yoga to concerts and movies.